To commemorate our 30th season, the QH Pirates have organised a special gift for every registered player. These were to be given out on our presentation day but some manufacturing delays hurt us. See pics below, don't they look absolutely awesome! 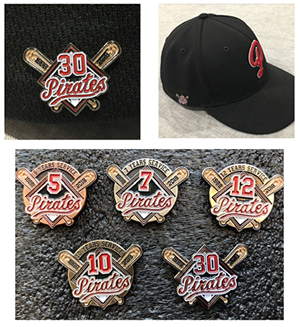 NOW Our 30th anniversary pins are available for collection on Wednesday nights whilst major league training is on between the times 6.00pm to 8.00pm and on Sunday junior development days which is also the Pirates Winter Major League Home Games. These we will be presented on our Opening Major League round at Corbin Sunday 28th April 10:45am. Please lock this time and date if you were a 5,7,10 & 12 Years Service recipient this year. Also any players wanting to complete their pin collection can purchase the 5, 7, 10 years service pins for a one off special price during Winter Major League of $5 each. Thanks for being part of our Pirates Family and our 30 Season. Pirates please congratulate our 15th and 16th Life Members. Presented by Michelle Rowland, Federal member for Greenway. Lee first joined the Pirates back in 2007 playing seniors baseball. He quickly volunteered for a role with the juniors in 2009 as the U7’s coordinator which that year had a record 14 x U7 teams. In 2010 he volunteered to take over the Seniors VP role and held this position for a record 5 years. Lee was a extremely active committee member and also had many other roles within the club which included Coach, Manager, Grounds men and anything else that the club needed. 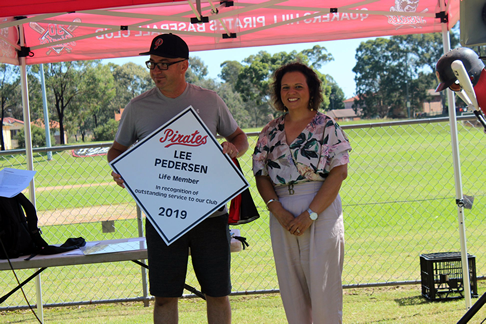 Also during this time the Pirates Seniors had a record number of teams and Lee’s leadership skills ensured the Pirates seniors part of the club Prospered. Lee was one of the most active pirate members over this period and only left the Pirates due to work commitments in Melbourne. 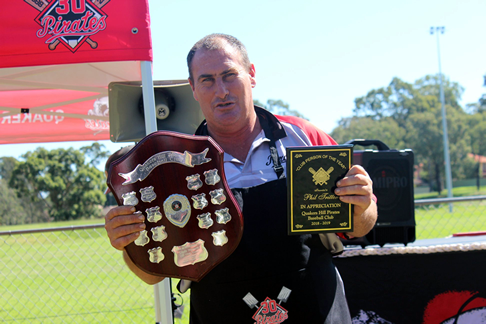 Lee we are honored to induct you to be the Quakers Hill Pirates 15th Life member. Jacko has been one of hardest workers the Pirates have ever seen over the last 10 years. His hard work on and off the field is for all to see from the Pirates Website to the Pirates very own field of dreams Corbin reserve. As our current head grounds men, Website coordinator and graphic artist, his skills and dedication are the envy of Ball clubs all over Sydney. Jacko goes above and beyond to ensure Corbin reserve is one of the best baseball fields in Sydney, he to this day continues to give up hours of his own time week in week out. 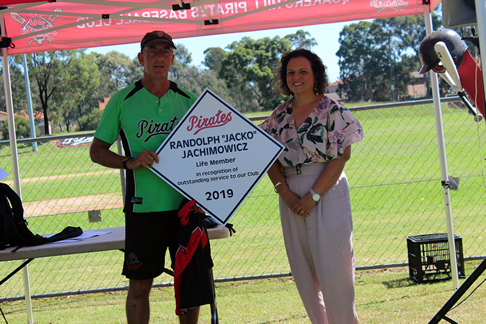 It is with our pleasure to induct Jacko as the Quakers Hill Pirates 16th Life member. The full rap up of all todays Junior Presentation Day Major Award Winners. Congratulations to the Pirates 2018-19 Club person of the year, Phil Tritton. Also a massive thank you to all our other volunteers across the club!